The MG Midget is essentially the same car as the Austin Healey Sprite. This Midget has been modified for racing by bhp developments and was raced by Jeff Lane in S.C.C.A. “F” production. Previous F production cars had the exhaust running under the car which allowed for a ground clearance of 4 to 5 inches. In the late 1980s, Bob Griffith of Bhp developments set the standard for future cars by running the exhaust pipe through the drive shaft tunnel, thus allowing for a ground clearance of 1.75 inches. This is one example of the many advanced innovations on this car. The front motor mount is a sandwiched aluminum plate tying together the steering rack and the front suspension. The engine is dry sumped. 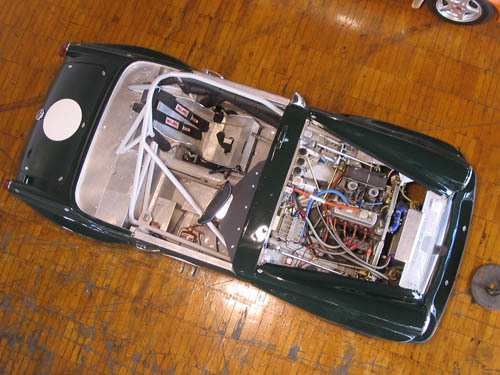 After completion, the car was so light it needed 150 pounds of ballast to make the minimum weight requirement. This car is retired from racing and has been beautifully restored to perfect running condition by Chuck Callis. Manufacturer: MG Car Co. Ltd.